With Most Of Europe Still On Its Back, Sweden Tries Policies That Actually Work. Borg also wants to lower the corporate tax rate as a way of meeting the government’s goal of “full employment”. The government has already cut property taxes and other luxury taxes on the rich to lure investors and entrepreneurs back to Sweden. The government has also slashed spending across the board, including on the welfare programs that used to be Sweden’s claim to fame. They’ve also installed caps on annual government expenditures: real and enforceable limits that the Swedes believe are pivotal to economic stability. They explain in their Policy Guidelines that “the expenditure ceiling is the Government’s most important tool for meeting the surplus.” Imagine that, a government that stays within its limits. So why didn’t Sweden hop on the stimulus bandwagon like the U.S. and much of Europe? Anders Borg explains, “Look at Spain, Portugal or the UK, whose governments were arguing for large temporary stimulus… Well, we can see that very little of the stimulus went to the economy. But they are stuck with the debt.” We have now seen that attempts at austerity within the Eurozone have met a similar fate: none of it was serious. As spending increases have been squandered, spending cuts have been a charade, failing to target the big government programs at the core of the debt crisis. 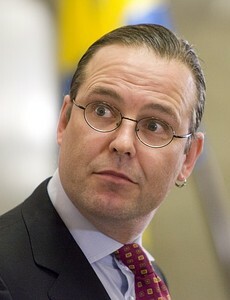 So Anders Borg and the Swedish Government have undertaken an economic and budget plan that slashes taxes and (actually) caps government spending. If you told Paul Krugman and the rest of the Keynesians back at the onset of the financial crisis that Sweden’s finance minister was planning such action, they would have surely laughed in your face and cynically predicted doom and gloom for the Scandinavian nation. However, in reality, a place Keynesians seem to be unfamiliar with, it’s become clear that what Sweden is doing is working. And it’s working better than even Minister Borg expected. Despite slow projected growth for 2012, Sweden is expecting annual GDP growth of over 3 percent starting next year, projected out through 2016 by which time their unemployment is expected to slide down to just about 5 percent. During this time the Swedish gross debt is expected to drop from 37.7 percent/GDP to 22.5 percent/GDP as a result of government surpluses. For comparison, US gross debt to GDP is well over 100 percent and climbing. All this success must be on the backs of the working class right? Wrong. Wages are slated to rise in Sweden by nearly 4 percent annually through 2016. This entry was posted in 2012 Primary, Budget, Econ, Europe, Obama, Sweden, Taxes, True Talking Points and tagged business, climate, economy, government, politics. Bookmark the permalink.